Black Embossed Gift Card Holder Box 3-7/16x2-3/16x9/16"
Black Embossed Gift Card Boxes by the carton are great for dressing up retail gift cards and phone cards. Includes riser insert. Made in the USA. Great for masculine gift pacakging. 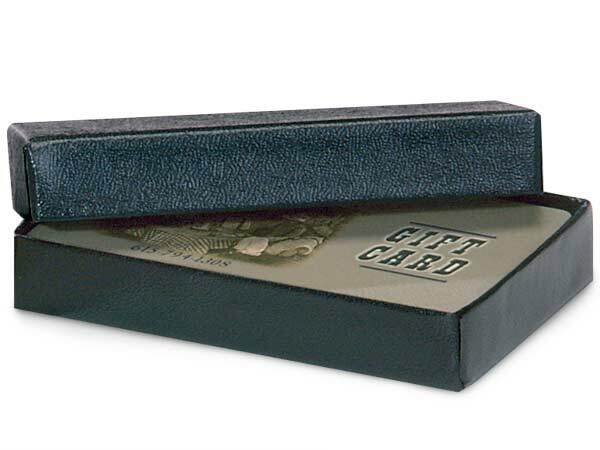 These Gift Card Boxes are great for holding retail gift cards, phone cards or other flat cards. These rigid boxes come with a white embossed die-cut riser for holding the gift card. They make great resale items. Made in the USA of USA materials.